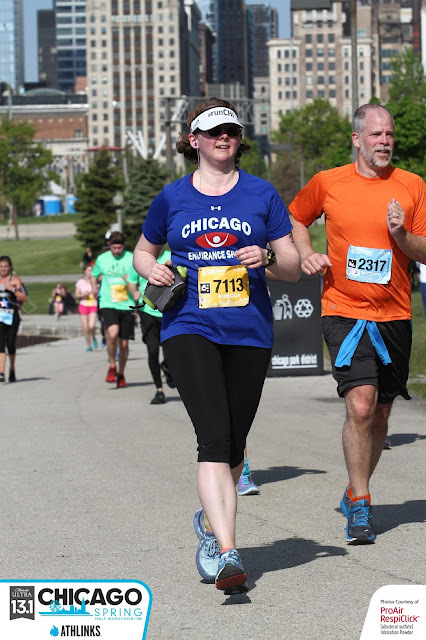 The Chicago Spring Half Marathon and 10k was a race that I had been wanting to run for the past couple of years after hearing some really great things about it. I was always hesitant, however, due to it being the week before Soldier Field 10 Mile and being completely on the Lake Front Path, which can't be closed to the public during races and which I can run for free any day I want to. This year, I finally pulled the trigger and signed up for the 10k. I was already registered for Soldier Field, and I didn't want to push too much, so the 10k seemed like the perfect distance. Packet pick up was offered several days leading up to the race at Fleet Feet's Old Town location, or there was will call packet pick up the day of the race for an additional fee. Not wanting or needing to pay extra for packet pick up, I made my way to Fleet Feet after work one day and walked out with my packet in hand in less than five minutes. The morning of the race was gorgeous! Blue skies, sunshine, a light breeze...the perfect spring day in Chicago. I ate a quick breakfast, grabbed my gear check bag, got dressed, and headed down town. The race site was located in the Park at Lakeshore East, with the starting line and corrals being just east on the lakefront, about 1/3 of a mile away from gear check. If you ever don't know where to go to get to a race site, just follow the other people in running gear. I stopped by the Chicago Endurance Sports tent to greet friends and take care of some pre race business - applying sunscreen, filling my water bottle, pinning on my bib number, etc. I was excited to run, but I quickly noticed that the half marathon was clearly the big draw, as I wasn't seeing too many 10k bibs (blue bibs for half marathon and orange bibs for 10k) as I wandered around the race site. So pretty! I can't believe I had never been to this park before! Another indication was the fact that pre-race gear check was scheduled to close at 6:30am, which worked well for those running the half, but for those of us running the 10k, that meant arriving over an hour before our race started if we planned to check a bag. Pretty and peaceful....or at least it was peaceful until thousands of runners showed up. Sorry to all the neighbors! The park was really beautiful, and I was there really early, so I had time to sit back and relax and enjoy my surroundings before the race began. I found a shady spot where I could hang out for a bit and stretch (I've been having problems with really tight calves) before the race began. When it was about time for the half marathon to begin, I made my way to the restroom. There were plenty of port-o-potties at the race site, as well as some near the start corrals, but the lines were long and confusing, as it was hard to tell if there was one long line or multiple small lines. Also, by the time I visited the facilities, many port-o-potties were out of toilet paper. Thankfully, I always carry a travel pack of tissues with me during races for just this reason. Always be prepared for anything! I made my way over to the start area in time to cheer on some friends as they started the half marathon. The 10k was scheduled for a 7:30am start, but I didn't know where to go or what to do, as there was no clear place for the 10k runners to wait. All of the race information said that 10k runners would use the last corral, but where was the last corral? As more half marathon corrals were released, a man holding a big 10k sign finally showed up, and we started trying to line up for the race. The view from the 10k area wasn't too shabby. The half marathon corrals were assigned based on estimated finish time, but the 10k was self seeded. This would have been perfectly fine if there was some way to help people line up, signs with estimated pace or something similar. Unfortunately, there was nothing to help with the self seeding beyond an announcement for the fast people to move to the front and the walkers to move to the back. I found my way to the middle of the crowd and hoped for the best. The half marathon started at 7am, and the 10k was scheduled to start at 7:30am, but it took longer than expected for all the half marathon corrals to all get over the start line, and then we had to wait for the all clear from course personnel, so the 10k ended up starting over 20 minutes later than expected. Pre race selfie featuring a few hundred of my running buddies for the day. By the time we started, the sun had managed to heat everything up a bit more than I would have liked, and I was suddenly very glad that I was running the 10k and not the half marathon. Once across the start line, I found a comfortable pace that was a little slower than I would normally run for the distance, but that I knew I could sustain despite the increasing temperatures. By the time I hit the first mile marker, I was feeling good. I was a bit too warm, but my pace was comfortable, I knew where the aid stations were, and I was confident that I would nab an easy 10k PR. I may still be slow, but I'm not nearly as slow as I was at my previous 10k. I soon met the Back of the Pack Crew for the half marathon, who were the event staff who were in charge of bringing up the rear of the race and signified the end of the field for the half marathon. Before too much longer, I was encountered other half marathon runners/walkers. By the time I hit the second mile marker, however, things had changed. My stomach was not happy, and I was worried about losing its contents as it churned uncomfortably. As I was fighting to keep my stomach contents inside my stomach, my feet suddenly went numb, which is not a pleasant sensation or something you want to happen while running. I slowed to a walk until I regained feeling in my feet. This was something that I would have to do several more times during the course of the race. Before I reached the turn around for 10k, we were encountering the faster half marathoners on their way back to the finish line. The leaders were each met with cheering and applause as they flew past the 10k runners. At the turn around, which was clearly marked, it was important to slow down and merge with the half marathon traffic so as not to injure yourself or another runner. Sadly, my feet were once again numb, so I quickly moved to the far side of the path to loosen my shoes, in hopes that this was the cause of the problem. For the remainder of the race, I had to keep slowing down to a walk in order to regain feeling in my feet, all the while fighting with the churning in my stomach. I was hot, uncomfortable, and starting to beat myself up for my less than great performance. In the last two miles, I abandoned all plans for specific finish times and changed my goal to simply finishing under my own power. This actually helped a bit, and my spirits lifted as I reminded myself how far I've come in the past couple of years and that I could and would finish the race. I have never been so happy to see the final mile marker and know that the finish line was close. I was feeling ill and sped up as much as I was able to in order to get across the finish. I crossed the finish line, was handed the usual post race snacks - water, electrolyte drink, banana, pretzels - and a finishers medal. The Ferris wheel actually spins! This may be the coolest race medal I've gotten. I'm just a little bothered by the large 13.1, as I didn't run the half, but they were giving the same medal for both distances. I quickly found a shaded place to sit until my breathing was normal and sipped water until my stomach calmed down. Once I was feeling better, I stretched for a good long time and tried to work out a knot that had formed in my calf. My final time was 1:06:15, which still gave me a 10k PR, but it was still a long way from the finish time was I hoping for and should have been able to accomplish. Even so, I was happy to have a new PR and thrilled that my many walk breaks had not hurt my time as much as I thought they would. Now I just need to figure out what was happening with my body that caused all of my problems. I made my way over to the main race site to partake in the post race festivities. There was food and drinks and various tents with giveaways and raffles or merchandise for sale. Although it had been pretty empty earlier in the morning, the race site was now hopping with activity, as hot and tired runners made their way across the finish line and went in search of refreshments. More and more people slowly filled the park. Having my priorities in order, my first stop was the food. There was a full breakfast buffet for all runners. You just had to turn in the breakfast ticket from your race bib to gain access to the buffet, and it was pretty amazing: scrambled eggs, sausage, potatoes, pancakes, fruit, and beverages. They even had little packets of butter, syrup, and hot sauce. I think it may have been the best post race food I've ever had and was much better than the usual snacks or sad slice of pizza. I took a little bit of everything, making sure that I didn't forget the hot sauce, and grabbed an extra bottle of water. There was also beer, and each runner had two beer tickets to use after the race. Not feeling in the mood for beer, I gave my tickets to a couple of other runners to use. I made my way back to the Chicago Endurance Sports tent to eat my breakfast with some of my CES friends. After eating, I stretched some more and then made my way around the site. There were various giveaways - bags of popcorn, pretzels, and even some t-shirts and hats from Stio Mountain Studio. My favorite thing, though, was the fact that every runner got a flower to take home with them. It was a nice little touch for a spring race, and I loved it! My flower now lives in my kitchen, because that is the only place where it can get some sun with my cat messing with it. I named my flower Gertrude. Isn't she pretty? I wanted to watch the kids' race, but my watch was telling me that it was time to leave if I wanted to make it home to shower and change and still get to work on time. I made sure I had all of my things and made my way to the train. I'm glad I ran the race, even with all the problems I had, and I would run it again next year, though I would probably opt for the half marathon, as that seems to be where all the focus is. I just need to figure out why my body decided to rebel against me so that I can try to avoid having similar problems at future races. They also offered free photo downloads, so I finally have a race picture! Congrats on the PR! Sorry to hear that things with your feet, calf and tummy went south. Hopefully, you'll figure out what happened. I ran along with this race on my 20 miler that morning, it was a picturesque run by the lake! Also, it's very cool you got a flower too! Thanks, Pete! It was a strange assortment of problems, and I'm still trying to figure out what happened. I always forget how pretty the lake is, as I usually run along the North Channel Trail.